Corby is an excellent example of what can be achieved by following through a shared vision and co-ordinated regeneration framework. Corby has had a clear sense of purpose since 2000 – to regenerate through growth and double the population to 100,000 people by 2030 with a complementary increase in jobs, prosperity and public services that rank with the very best. Today it is the fastest growing borough outside of London. The 2003 Regeneration Framework created a robust and ambitious blueprint for changing perceptions of the town and transforming the local economy. The council remains committed to working with its partners to deliver that vision and are on course to achieve their growth targets. The council has delivered an ambitious programme of investment in key projects and infrastructure. Early wins was achieving a direct rail route to London and a new railway station that makes a modern statement about the town’s forward-looking ambition, the transformation of the town centre into a pedestrian friendly environment including the iconic Corby Cube and great public spaces, creation of The Corby Enterprise Centre with flexible and innovative space for new businesses. Corby has prioritised delivering green space in its new urban extensions. The 70 hectares of ancient woodland on the western boundary have been reconnected to the town centre by creating a broad walk (the Pat Fawcett Way) that provides direct access into the town centre, making the ancient woodland less than five minutes from the shopping centre. The woodland has Green Flag status and a strong volunteer community of all ages. The town’s strategy has been to both attract new industries and jobs into the town, which it has achieved, while ensuring it delivers a good quality of life for its growing population. This includes building of a new Olympic size swimming pool in the town centre and creating community centres in every new housing community. Corby has deliberately chosen not to extend existing communities but to create new ones. Using design codes, each has a mix of different housing, environmental features, a community centre that acts as a hub for local activities and a school, supported by formal and informal green spaces. The council has retained 70 per cent of their housing stock and invested in it. If you haven’t been to Corby recently, then read on because the town today is very different to the Corby of 10 years ago. Corby has achieved what many towns in the wider ripples of the ‘London effect’ hope to achieve – a desirable, affordable, well-connected place to live and bring up a family, whether you are a commuter into London or working locally in one of the many new businesses that Corby has attracted to replace the steel industry jobs that once formed the main employment base of the town. While perceptions of Corby may still be a little behind the reality, the growth in population shows that more people are choosing to live there. Corby creates a fantastic example of what can be achieved in urban transformation and how a New Town that lost its dominant industry has reinvented itself and evolved in ways that are relevant to today’s society. There is a lot of learning here. Corby does not blow its own trumpet very loudly but has just quietly got on and achieved change through the commitment of its civic leadership. The former Urban Regeneration Company produced A Regeneration Framework in 2003. This framework created a blueprint for change and delivered a sense of purpose and clear direction for the town, which remains relevant and the framework is still used today. There has been a clear focus on placemaking and creating a great place to live. Culture and leisure have played a key role and there is an increasing focus on health and wellbeing. Much of its success is about a consistent ambition that means Corby punches above its weight on many fronts. While Corby pays homage to its steel heritage, it is not constrained by it. The local authority has embraced a modern forward-looking approach to planning its future and promoting economic change. The new station, with a fast train service to London, has been an important early achievement. The clean modern lines of the station and its straightforward design, is reflected in the way the town and its hinterland have been developed. The town centre has an airy open feel despite being quite compact. Opening the town into the woodland and involving community groups in its management has transformed the relationship between the town centre and the woodland and how it is viewed and used by local people. The juxtaposition between the woodland and the town centre is extraordinary. A cluster of facilities in Ashworth Square – the Olympic-size Corby East Midlands International Pool, the Corby Cube and a cinema (recent winner of Midlands Property Design Award) form the main core of buildings – are just a few steps away from the woodland linked by a wide pedestrian walk that within a few yards changes from paving into a woodland path. This area is particularly well designed, and consequently well used, both during the day and in the evenings. It has been deliberately designed to deliver a family orientated evening economy. In the other direction the street crosses a road and you are in the pedestrianised shopping area. A walk through the woodland connects the town centre to the GP practice and urgent care centre. 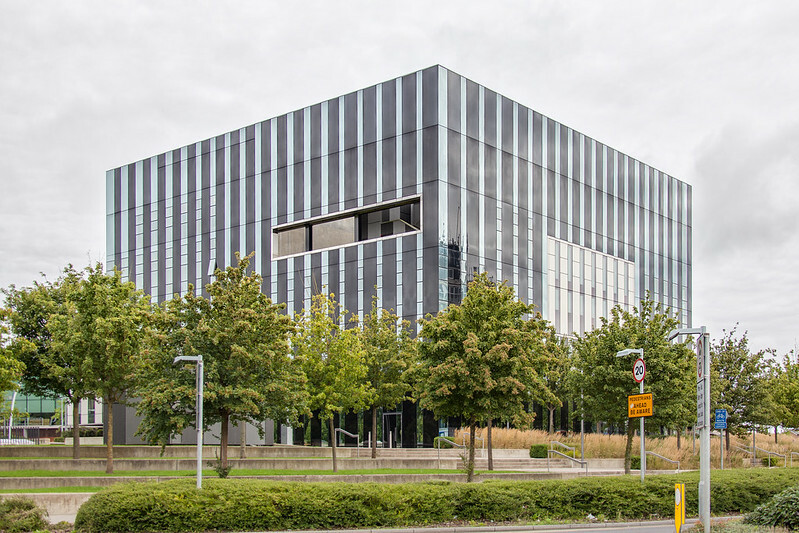 The Corby Cube combines local authority offices, community one-stop-shop with an integrated theatre and library that has been designed so that the public walk through the library to reach the other services – a feature that has resulted in a significant increase in the numbers using its facilities. The assessors were also impressed by the way the shopping area is being managed and evolving to provide for its growing population. The pedestrianised shopping centre is privately managed and provides the usual mix of chain stores but there is also an area with independent shops and a lively and well used street market, carefully managed to retain a balance of different types of stalls. Some of the stall holders move into retail units and there is an ongoing programme of investment in units to help retain the smaller businesses and deliver for their needs in terms of size and layout of units. 38 per cent of retailers are independent and they are keen to maintain that. Single ownership of the shopping centre enables them to ensure there is not over and repetitive provision of particular types of shop, which in turn helps to support the vitality and variety of the town centre. Corby has proactively sought to create and retain jobs in the town. There are generous business rate reliefs available up to the EU limit. Food processing and logistics are the main employment sectors considering further expansion. There is an innovation hub and enterprise centre with start-up units. Corby is clear that it does not want to be a commuter town for London. Creating and retaining new companies has therefore remained an important focus. The town is on course to achieve its growth targets in population, which means the scale of housing development is impressive. There is interesting learning here for other places. The policy has been to create urban extensions as new communities rather than add additional housing to existing communities. There has been significant focus on achieving design quality, the use of design codes and the early delivery of social infrastructure. Each community has a school and a community centre and there is a strong commitment to providing formal and informal green spaces. The management of nine community centres has been devolved to local communities, with the council providing small grants to support their management committees. These centres provide a range of informal learning, and act as hubs used extensively by various groups within the community. The housing stock is varied and they aim to have a mix of different styles. Solar panels and water reuse features are integral to many of the new houses and are part of the town’s commitment to environmentally sustainable and responsible development. The council is working closely with adjoining authorities through the North Northamptonshire Joint Planning Unit, with the preparation of a joint core strategy. This has enabled co-ordinated planning and continued access to shared design management skills at a time of resource constraints. Together, the authorities are seeking to maximise investment opportunities such as the Oxford – Milton Keynes – Cambridge corridor. Corby is punching above its weight. And has made some impressive steps to achieving its ambitions.